The #BringBackOurGirls group has demanded an apology from the Inspector General of Police, Ibrahim Idris, over police’s attempt to stop the group’s protest march to the presidential villa on Tuesday. A leader of the group, Oby Ezekwesili, said, Saturday, on Twitter, “The Inspector General of Police owes a big apology to us #BBOG and the public whose movement he fragrantly disrupted”. 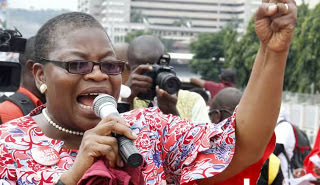 Mrs. Ezekwesili, a former minister of Education, has been at the fore-front of the group’s continuous protest against the federal government’s inability to rescue the over 200 Chibok girls abducted since 2014 by the extremist group, Boko Haram. Mrs. Ezekwesili’s tweet followed the police announcement on Friday that there was no ban against public protest in the nation’s capital, Abuja, and other parts of the country. The police announcement, which was issued by its spokesperson, Don Awunah,contradicted its earlier position on the issue. “The IG has finally read a copy of (the) 1999 Constitution and his #BBOG File,” Ezekwesili said in another tweet, apparently referring to the u-turn made by the police. The police statement said that public protest was part of democracy, but that it must conform to the rule of law and public order. “The Nigeria Police Force recognises the constitutional rights of every law abiding citizen to express his or her view through public protest/procession and other legitimate means,” the statement said.